Santiago has been confirmed as the host of the 2023 Pan American Games, after the Chilean capital's bid was unanimously approved by PanAmSports members today. 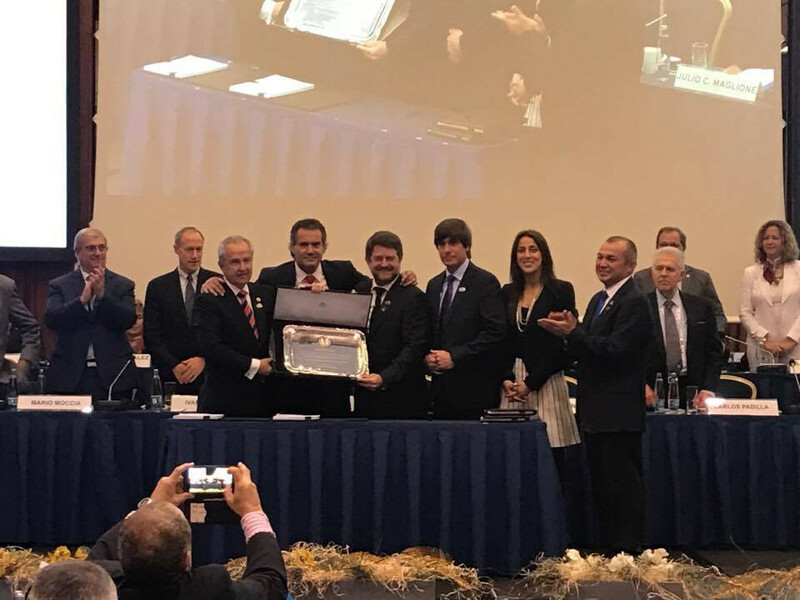 The decision was taken at the PanAmSports - formerly known as PASO - General Assembly here, with Santiago 2023’s proposal and an Evaluation Commission report having been presented. Santiago was the sole bidder for the 19th edition of the Games, following the withdrawal of Buenos Aires earlier this year. The city will also stage the Parapan American Games, with International Paralympic Committee President Andrew Parsons among those to sign the agreement today. Pablo Squella Serrano, Chile’s Minister of Sport, was among those present at the Assembly to secure the agreement. The official previously competed at the Pan American Games, finishing fifth at Indianapolis 1987 in the men’s 400 metres hurdles and 800m. “It was my honour to be present at the Pan American Games as a sportsman,” said Serrano. “We are sparing no time and effort to welcome you in 2023. “We have many more assets to host this event. “On behalf of the Government and population, we are very proud to be able to head this bidding process. “We have worked hard and want to make this dream a reality. “Our efforts are designed to achieve this aim and we are ready to host the greatest sporting event in the Americas. “We have much more experience than four years ago when we last bid, we have professionalism and great sportsmen. “We are prepared to make superhuman efforts and we have a common goal. 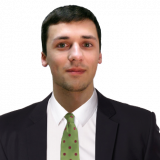 “They will help us to fulfil our aims and help us spread sports among young people. 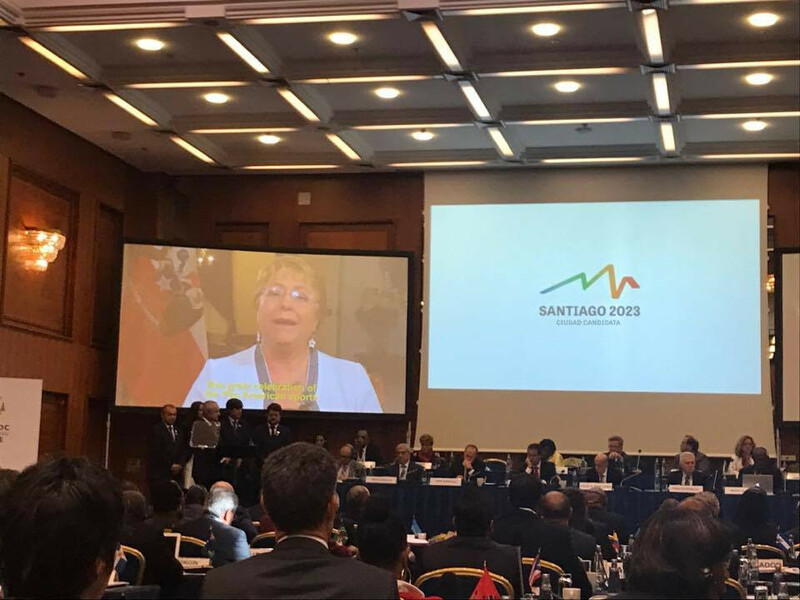 Chilean President Michelle Bachelet was included in the bid video, shown by Santiago 2023, highlighting the Government's support for the event. She vowed a "true celebration of sport" at the Games, with the President having previously expressed her backing when greeting PASO officials in September. A total of 39 sports will be contested in Santiago 2023, with venues spread across five different clusters. The current programme is completed by sailing, shooting, skateboarding, skating, squash, surfing, table tennis, taekwondo, tennis, triathlon, volleyball, water skiing, weightlifting and wrestling. This will include baseball and hockey centres, as well as a redeveloped swimming pool. Santiago 2023 claim 70 per cent of venues are included in a 22 kilometre radius, with organisers stating a modern transport system will be in place for the Games. A metro system, which is currently under construction, will be central to the transport plan. It was claimed the Pan American Games Village, when built, will be a 12 minute journey on the metro to the Estadio Nacional Julio Martínez Prádanos. The National Stadium will host both the Opening and Closing Ceremonies of the Games, as well as athletics. The Opening Ceremony is due to be held on October 6, with the Games expected to draw to a close on October 24. The Parapan American Games will follow from November 3 to 11.